In this February 2 file photo, TT Red Force captain Denesh Ramdin catches the ball from a fielder during their encounter against the Guyana Jaguars at the Queen’s Park Oval, St Clair. 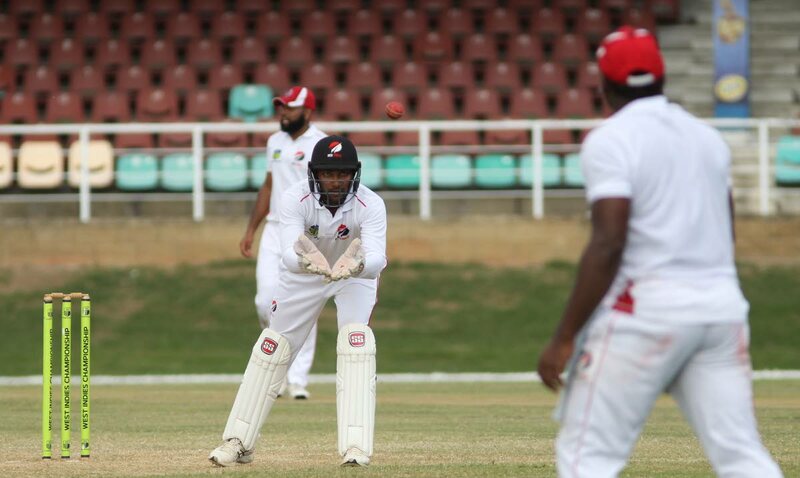 CAPTAIN Denesh Ramdin is keen on maintaining the core group of TT Red Force players for the 2019-2020 season. The Red Force finished fourth in the six-team 2018-2019 West Indies Four Day Championship with a tally of 112.4 points. In an interview on Sunday, after the Red Force’s 85-run victory over the Jamaica Scorpions in their final 2018-2019 Four Day Championship match at the Brian Lara Cricket Academy in Tarouba, Ramdin said, “I don’t want to change and use 30-40 players in a season, we want (about) 20 players and we’ll give them more experience, exposure and chances to win games. He does not foresee much changes to the Red Force team ahead of the 2019-2020 draft. Sunday’s victory was the first for the Red Force, at the first-class level, at the Tarouba venue. “It’s always good to win cricket games especially one at this venue,” said the ex-West Indies captain and wicket-keeper. “We haven’t won any games here and (against the Scorpions) I think we played some good cricket. I think Brandon King (who made a valiant 133 in the Scorpions’ second innings) batted exceptionally well but the fight from the guys was exceptional throughout the four days. He touched on the performances of batsman Jason Mohammed, who made 94 and 110 not out in the respective innings, pacer Anderson Phillip (who grabbed his first five-wicket haul) and seasoned campaigners Shannon Gabriel, Imran Khan and Lendl Simmons. He added, “Two games for the season, the Barbados game (with the Pride chasing 324 to register a fourth-wicket win) and the first game we played for the season here that I was absent for (a 76-run defeat to the Windward Islands Volcanoes at Tarouba), I think those were the two games we could have (done better). Reply to "Ramdin keen on maintaining core Red Force group"